If your house is anything like mine right after the holidays, it’s strewn with bubble wrap, boxes, wrapping paper, and lots and lots of stuff. After I did a bit of cleaning, that bubble wrap just didn’t want to be put away. While enjoying popping most of it with the tot, I thought of a fun way to use the rest for a creative art activity. 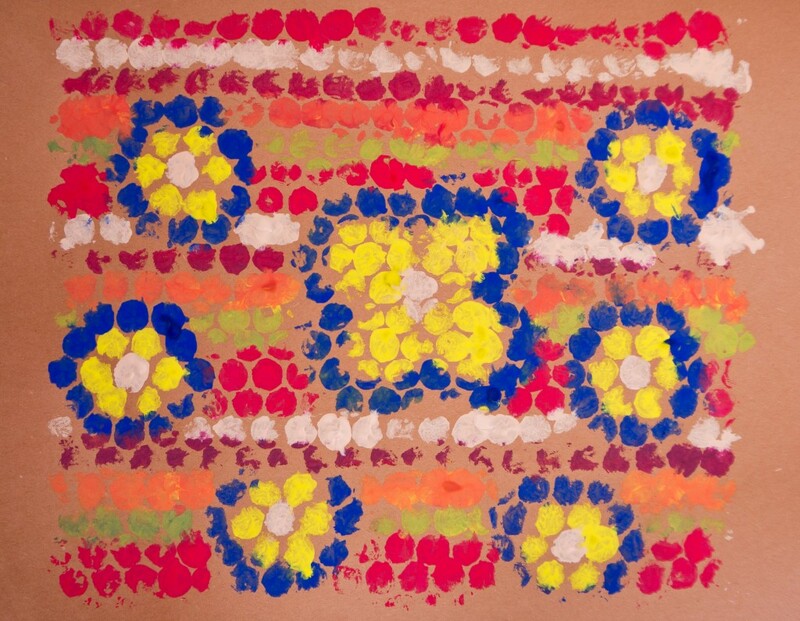 I got out the paints, paintbrushes, and some brown construction paper, and then pulled the tot up to the trusty laptop and shared with her some images of Aboriginal dot art. You could say Aboriginal rock art is the original art with some examples dating back over 60,000 years ago. Using swirling lines, dots, shapes, and repeated designs, Aboriginal dot art is vibrant and organic – and was originally created with the use of natural pigments such as ochre and painted onto cave walls or hard sand. These artworks also contain symbols and stories representing the Dreamtime, or explanations for why certain things are the way they are. During the “time before time” Australian Aborigines created these special stories to teach and share traditions. 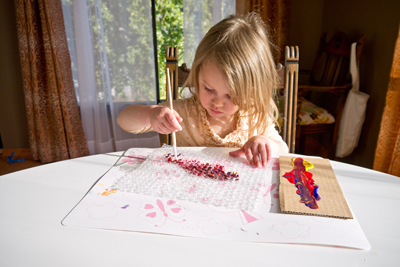 Take a look at examples of dot art as well as Aboriginal symbols with your child before getting started. 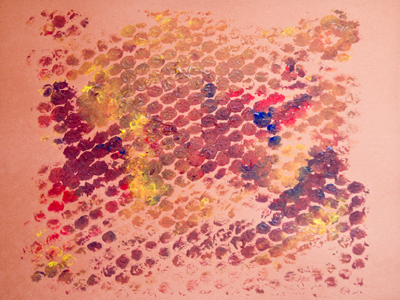 Encourage your child to select a theme or symbol as a base for her Aboriginal dot art creation. She can focus on an animal or one of the traditional symbols and create a couple of sketches before working on the bubble wrap. 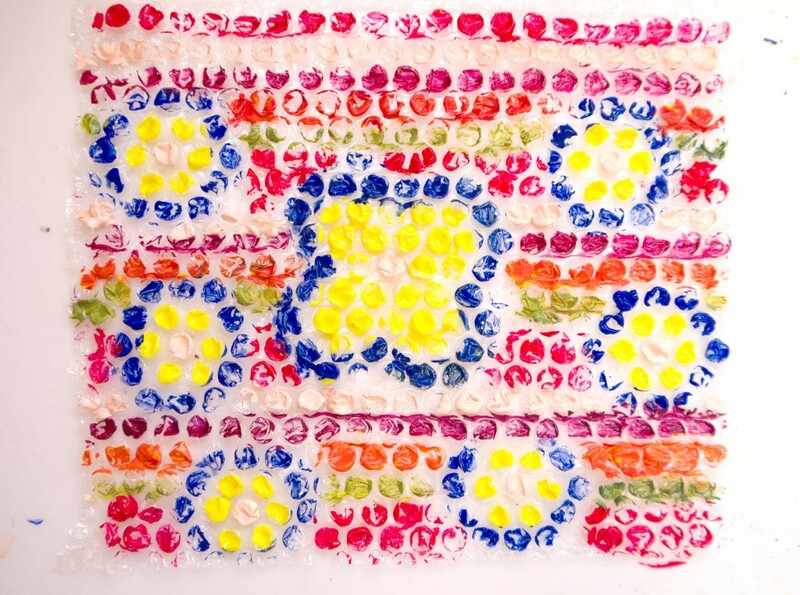 When she’s ready, invite your child to paint her design onto the bubble wrap using vibrant colors of tempera paint just like the Aboriginals did. Now she can radiate the design by creating repeated lines around the central shape. Once she’s finished offer her a sheet of brown construction paper and then press on top of the bubble wrap. Now she can lift the paper to reveal her own unique Aboriginal dot art. Now your child can gently wipe the bubble wrap and continue to paint and create using different colors of construction paper and designs! She can even write her own unique Dreamtime story to go along with her creation.